This particular open-air termination transitions an underground line to a riser. Although visual inspection indicated that the cable was properly installed (it is difficult to see the mastic placement with the termination installed), the cable system failed to meet IEEE 48 performance requirements when subjected to the IMCORP Factory Grade® assessment. Further inspection of the cable found the cause to be the improper installation of the stress control mastic (light grey material). During the installation process, the cold shrink termination and stress control mastic were placed too high on the cable leaving the cutback exposed. 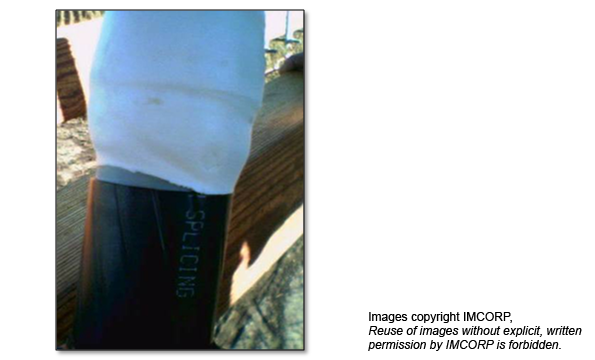 The improper installation of the mastic created an air void between the insulation and the outer stress control tube. The mastic is designed to fill voids at the semicon step. When it is misplaced, the air void at the cutback is not filled exposing the insulation to corrosion associated with PD and eventual failure.